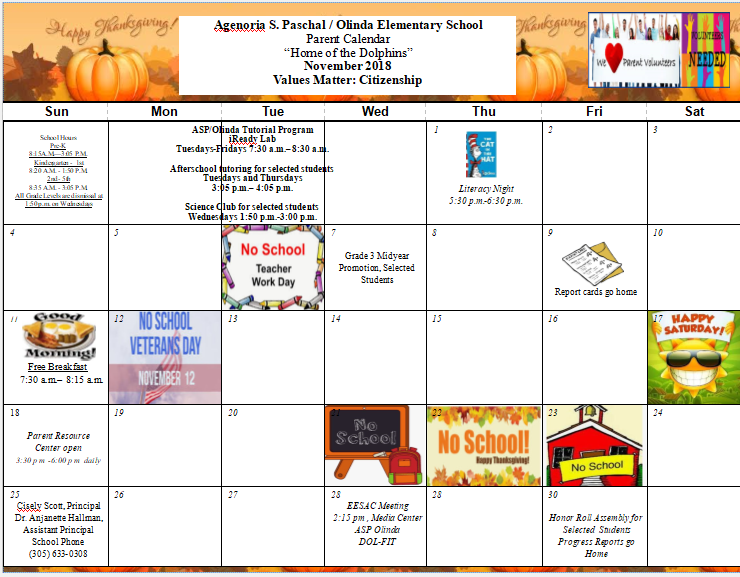 Agenoria S. Paschal/Olinda Elementary School’s mission is to provide a multifaceted educational environment to all stakeholders through the delivery of data driven curriculum. Programs are designed to develop family literacy; lifelong learning and cultural sensitivity to enhance the educational progress of the school’s community and its children. Professional and self-development opportunities will promote teacher proficiency. The authentic involvement of all members of the Educational Excellence School Advisory Council (EESAC) will ensure that all stakeholders are represented in the planning and implementation of the School Improvement Plan. This coordinated effort is intended to raise the expectations of student achievement, teacher performance, and community involvement. Dedicated to the cause of brotherhood and man’s dignity. We honor our colors, red and white. Of all the schools in this world we love our own Olinda best! We believe in freedom, it’s our philosophy.